With a particular focus on the eyelids, orbit and nasolacrimal system. Dr. Elahi has been featured in various media including The New York Times, ABC, CBS, and NY1. For many years he has been recognized by his peers through such publications as New York Magazine’s Best Doctors, Castle Connolly’s Best Doctors and Super Doctors. 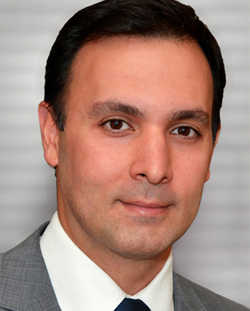 In addition to his practice which includes an advanced AAAASF-certified operating facility, Dr. Elahi also holds surgical privileges at Mount Sinai Medical Center, the New York Eye and Ear Infirmary, and Mount Sinai West. Invention related to an expandable implant to repair orbital wall or floor fractures using a minimally invasive incision to insert the device within the orbit. Adjustable orbital implant device intended to restore orbital volume for repair of deformity (trauma, surgery or congenital disorders) or for aesthetic purposes. The invention relates to a device for supporting and retaining the shape of a collar of a garment. • Haranhalli N, Elahi E, Yassari R. A Reply to Commentaries on "Surgical and Teaching Mission to Mongolia: Experience and Lessons". World Neurosurg. 2018; Mar; 111:437-438. • Haranhalli N, Gelfand Y, Abramowicz A, Siyez A, Elahi E, Yassari R. Surgical and Teaching Mission to Mongolia: Experience and Lessons. World Neurosurg. 2017 Feb 22. • Elahi E., "They don't see why you want to get in their way. In: Harvest of Innocence Leigh M, ed, Book Surge Publishing, NY; 2006. 37-42. • Eloy JA, Jacobson AS, Elahi E, Shohet MR. Enophthalmos as a complication of rhinoplasty. Laryngoscope. 2006 Jun;116(6):1035-8. • Elahi E. "Survival and hope in a globalized world." Centerpoint Now, United Nations 60th Anniversary Commemorative Issue (2005). • Spinelli HM, Shapiro MD, Wei LL, Elahi E, Hirmand H. The role of lacrimal intubation in the management of facial trauma and tumor resection. Plast Reconstr Surg. 2005 Jun;115(7):1871-6. • Elahi E, Meltzer MA, Friedman AH, Som PM. Primary orbital angiomatous meningioma. Arch Ophthalmol. 2003 Jan;121(1):124-7. • Meltzer MA, Elahi E, Taupeka P, Flores E. A simplified technique of ptosis repair using a single adjustable suture. Ophthalmology. 2001 Oct;108(10):1889-92. • Parsa FD, Miyashiro MJ, Elahi E, Mirzai TM. Lower eyelid hernia repair for palpebral bags: a comparative study. Plast Reconstr Surg. 1998 Dec;102(7):2459-65. • Patel BC, Elahi E, Anderson RL, Harnsberger HR. "Pneumofornix" (air under the eyelid): a normal finding. Ophthalmic Surg Lasers. 1997 Jun;28(6):520-2. • Brumeanu TD, Zaghouani H, Elahi E, Daian C, Bona CA. Derivatization with monomethoxypolyethylene glycol of Igs expressing viral epitopes obviates adjuvant requirements. J Immunol. 1995 Apr 1;154(7):3088-95. • Pricop L, Brumeanu T, Elahi E, Moran T, Wang BS, Troustine M, Huszar D, Alt F, Bona C. Antibody response elicited by T-dependent and T-independent antigens in gene targeted kappa-deficient mice. Int Immunol. 1994 Dec;6(12):1839-47. • Elahi E, Holt N. "Sight Saving Procedures." In: Roth R et al. The Role of Anesthesia in Global Health. 1st ed. Springer; 2014, p. 203-16. • Elahi E, Spinelli HM. "Eyelid and orbital surgery." In: Plastic Surgery: Indications and Practice. 1st ed. Saunders Elsevier; 2009. vol. 1, p. 851-67. • Elahi E. "Cataract surgery." In: Magill's Medical Guide, 3rd rev. ed. Salem Press; 2005. p. 422-5. • Elahi E. Spinelli HM. "Complications of cosmetic blepharoplasty." In: Spinelli HM. Atlas of Cosmetic Oculoplastic Surgery. 1st ed. Saunders; 2003. p. 161-5. • "Neurotoxin comparison: is there a difference?" World Ophthalmology Congress, Abu Dhabi (February 2012). • "Blindness and the bottom billion: global health challenges in the new millennium," Cornell Medical Center Dept. of Ophthalmology (2010). • "Orbital volumetric changes and surface anatomy," 4th Annual French-American Ophthalmology Symposium, Mount Sinai (2009). • "Minimally invasive approaches to the orbit and skull base," Annual Meeting of the American Academy of Otolaryngology, Washington DC (2007). • "Advances in periocular surgery," Mount Sinai International Winter Symposium of Dermatology (2007). • Advanced surgical techniques, Department of Ophthalmology (2002–12). • "Stolen Faces," Documentary and panel on acid violence in Cambodia, United Nations (2005). • "Healthcare in the global village," Chicago Health Forum, UIC (2005). • "Ethical dilemmas of tertiary subspecialty care," Oxford Bioethics Consortium, Oxford University (2004). • "Ophthalmology in general medical practice," Annual Meeting of the American College of Physicians (2004). • "Orbital and ocular complications of functional endoscopic sinus surgery," Goldman Lecture, Marriot Marquis (2003). • "Ethical dilemmas in subspecialty tertiary referral practice," Mount Sinai Ethics Committee (2003). • "Medicine in the 21st century: untangling the ethical implications of modern healthcare," Rockefeller University (2003). • "Use of deep temporalis fascia in eyelid lengthening procedures," Annual Meeting of Northeastern Society of Plastic Surgeons (2001). • "Pifaretti's technique of transpunctal endoscopic treatment of nasolacrimal stenosis," Annual Meeting of European Society of Ophthalmic Plastic and Reconstructive Surgery, Spain (2001). • "Managing trauma to the nasolacrimal apparatus," Guest lecturer at Mount Sinai-NYU Medical Center, Department of Otolaryngology Grand Rounds (2001). • "Information, healthcare and technology: the impact of the internet on the future of medicine," Tenth Annual Conference of the World Information Transfer, United Nations (2001). • "Medical school metamorphosis," Guest lecturer, Cornell Weil Medical College (2000). • "Developing psychospiritual approaches to change," American Psychiatric Association 148th Annual Meeting (1995). • Goldstein G, Park E, Elahi, E, Shohet M., "Surgical management of compressive optic neuropathy due to orbital osseous lesions," Triological Society 113th Annual Meeting (2010). • Schulhof J, Schwartz A, Elahi E., "Post-operative symptoms following topical clear cornea cataract surgery," Presented at The Association for Research in Vision and Ophthalmology 2009 - Submitted for publication (2010). • Shohet M, Jenkins AL, Elahi E., "Meningoencephalocele presenting as orbital varix". NASBS, Chicago (2007). • Friedman A, Elahi E. Spitz. "Nevus of the caruncle," European Ophthalmic Pathology Society, Prague (2005). • Elahi E, Ellison J. "Perioperative retinoscopy as a predictor of final refractive outcome in clear cornea cataract surgery with topical anesthesia," The Association for Research in Vision and Ophthalmology (2003). • Elahi E, Lyon L, Ashton A., "Variability in physician productivity in an urgent care setting," Mount Sinai Community Medicine Report (1995). • Elahi, E., "Significance of DAPI staining on invertebrates as a tool to study DNA evolution patterns using the holarctic frog as a model," Hofstra University Report (1992).